ACME Fine Art will conclude the gallery’s 2013 season with an important exhibition that consists of a group of sixteen rare drawings by one of Abstract Expressionism’s quintessential teachers and practitioners: Hans Hofmann. The exhibition will open with a reception from 5:00 to 9:00 p.m. on 1 November 2013 in conjunction with SoWa Boston’s First Friday festivities, and it will run through Saturday 11 January 2014. The drawings featured in the exhibition were created by Hofmann between the late 1930s and the mid-1940s when he was teaching at his eponymously named schools in New York and Provincetown. Most of the featured drawings were made in Provincetown and many are, in fact, plein air landscape sketches of Truro and Provincetown that depict dune, town, railroad, and harbor scenes. Some were drawn from Hofmann’s well used roadster, and cleverly capture the car’s steering wheel and windshield in the foreground. Other drawings are figure based abstractions drawn from the model. All of them brilliantly manage to bridge the gap between Hofmann’s cubist roots and the then avant-garde Abstract Expressionist movement that at the time had yet to be definitively named. All of the drawings are an education for the eye, and the vast majority of them have never been exhibited before. Regardless of their age, this group of drawings –both singularly and collectively- convey the spontaneity of expression and the vitality of spirit that are the hallmarks of Hofmann’s most important work. Concurrently in the gallery’s Front Room, ACME Fine Art will present an outstanding small group of figure drawings by distinguished mid-century artists Seong Moy, Haynes Ownby, Myrna Harrison, William Freed and Lillian Orlowsky that were made under Hans Hofmann’s tutelage between 1937 and 1952. The exhibition is titled Figure by Four. 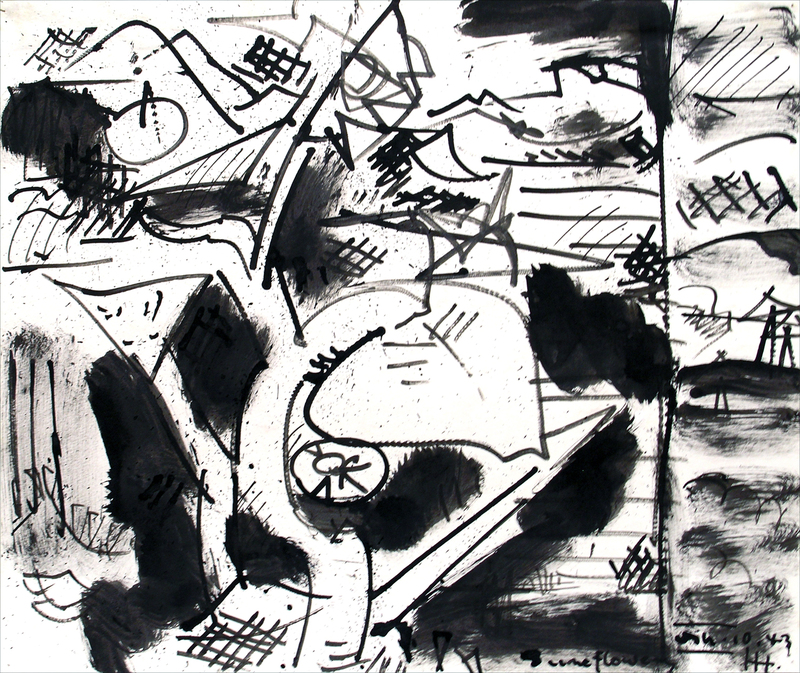 Each drawing making up the exhibition was made in charcoal on the 25 x 19 inch paper that was a common format for students in the Hofmann program. The stylistic diversity of this group of works demonstrates both Hofmann’s ability to customize his critique in dialogue with students, and the ability of these particular artist/students to respond successfully in their own unique voices. The exhibitions: HANS HOFMANN Early Drawings and Figure by Four will both be on view in the gallery from 1 November to 11 January and will also be on view on- line at www.acmefineart.com. For further information about the artists or the exhibitions please contact the gallery at 617.585.9551 or info@acmefineart.com. ACME Fine Art is now located at 1Thayer Street at 450 Harrison Avenue in Boston’s South End. Free parking is available. Gallery hours are 11:00 a.m. to 5:30 p.m. Wednesday through Saturday and by appointment at your convenience.